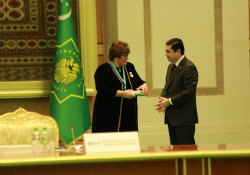 WHO Regional Director for Europe, Dr Zsuzsanna Jakab, receives the "Bitaraplyk" Order of Turkmenistan from President Gurbanguly Berdimuhamedov. The WHO Regional Office for Europe and WHO headquarters today received the "Bitaraplyk" Order of Turkmenistan, the country's State award, in recognition of their collaboration with Turkmenistan over the past 2 decades on public health issues. President Gurbanguly Berdimuhamedov presented the awards in the presence of high-level ministerial delegations from around the world at an international health forum in Ashgabat. The 2-day forum that opened today was organized by the Turkmen Ministry of Health on the occasion of the 20th anniversary of the country's national health programme. Mr Sapardurdy Toyliyev, Vice Premier of Turkmenistan, and Dr Nurmuhammet Amannepesov, Minister of Health and Medical Industry of Turkmenistan, were also present. Accepting the honours, the Director-General of WHO, Dr Margaret Chan, stressed the value of cooperation for health and development as a platform for the fruitful exchange of ideas, people, technology, experience and prospects for a better future. She highlighted the milestones achieved in the health-related Millennium Development Goals. "The momentum that led to these achievements will continue. It tells us clearly that investment in health development works," she said. eradication of polio, malaria and dracunculiasis. Turkmenistan has introduced many strategic health interventions, such as universal salt iodization, national drug policies and health promotion. It is currently preparing a new national health strategy that is aligned with the principles and priorities of Health 2020, the new European health policy framework. Dr Jakab acknowledged the country's continued collaboration with WHO and its leadership in health issues, which has resulted in considerable achievements. "Building on these achievements," she added, "the work should now continue within the framework of the new 10-year national health programme to address the most recent challenges that the world and, in that context, Turkmenistan is facing." Delegates from health and other ministries of countries in the WHO European and other WHO regions are discussing progress and issues of pressing public health concern at the forum. The meeting is expected to contribute to global thinking on health and reduction of poverty through the lens of the whole-of-government approach. Delegates will consider concrete examples of how European governments are making health a high priority in their social, economic and development agendas, with alignment to Health 2020. The discussions will centre on five themes: improving health for all, advances in noncommunicable disease prevention and control, achievement of the Millennium Development Goals and post-2015 prospects, foreign policy and neutrality, and whole-of-government action.